2 friends and the coast to coast walk | We’ve decided to walk from one side of England to the other. Gosh…no posts for 3 years?! What a poor, neglected blog this is (I’m not sure you can still call it a blog after 3 years of inactivity!). We have walked in the past 3 years, though no major LDPs or big adventures. 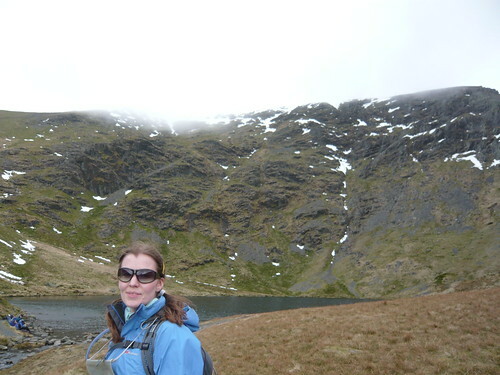 We had a list of peaks we wanted to tackle in the Lakes, but we soon realised that (as always) we weren’t going to manage many of them (there’s just not enough days in a week!). One of those peaks was Blencathra (meaning the bare hill-top shaped like a chair); sitting away from most other peaks and with such a distinctive profile it held much appeal. So when we awoke on Thursday to a beautiful bright, sunny day, it seemed that fate was on our side for once. We drove to Threlkeld, parked up and donned our boots, happy not to have to wear our waterproof trousers again. We began by heading NE out of Threlkeld, crossing Kilnhow Beck in the process. Passing through Gategill farm, we soon picked up the path which runs along the wall at the base of Blencathra, which we followed for a few miles, crossing a few becks and encountering a scramble or two. We met a chap coming the other way who had turned back as the scramble down at Scaley Beck was too tricky; forewarned, we continued and managed (with some awkwardness) to scramble down and safely cross the beck. 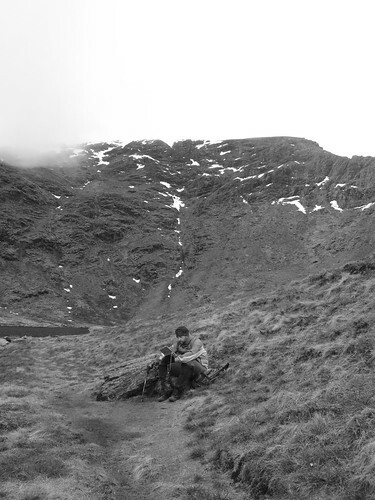 Eventually be began to turn north, heading around Scales Fell to pick up the path towards Scales Tarn. Let me pause to make a comment about navigation. At this point in the walk my better half took a look at the map; I’d been navigating up to now, not that it had been very challenging so far. I was confident about where we were and where we were heading, but Sid jus couldn’t get his head into the map. He was getting quite frustrated as he just couldn’t connect our surroundings with the features on the map. This is something I’ve noticed happen before; if you haven’t been navigating from the start you haven’t had time to absorb the map, to get used to the orientation and the features around you, and consequently you can find it difficult to place yourself on the map. …Lesson: leave the navigation to one person (unless they ask for help), or both use the map throughout the walk. 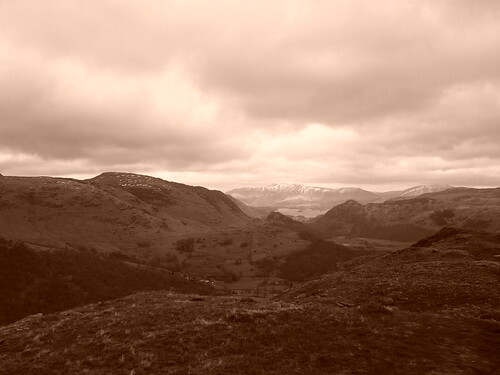 Our return route took us SW along the ridge and down to Knowe Crags. Most of the descent was easy-going; we were even chuckling at one particular section where many, many zig zags have been created to make the ascent easier (very easy on the way down). It was nice to come out of the cloud and see some reasonable views over Keswick. After a while we cut back SE, encountering some steep, slippery sections, and some worn out moany students and their bored leader, finally we returned to Kilnhow Beck and Threlkeld. We were so chuffed to have completed this walk (including the summit) and only a little disappointed not to have tackled Sharp Edge. Overall, highly recommended! Better known as Glaramara, “the mountain with the shieling (hut) by a ravine” was the first walk of our Easter week in the Lakes. 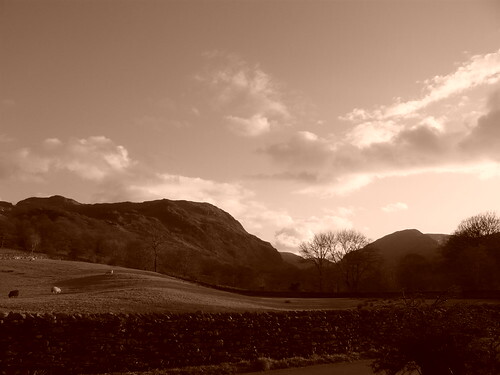 We spent the week in Doves Nest cottage in Borrowdale, which was a perfect starting point for a trip up Glaramara. The path alongside Combe Gill started practically outside our door and so was very easy to find. We were soon ascending gently with Combe gill rushing past below us; following a morning of rain the gill was fast and furious. As we climbed to wind also became fast and furious, with some very strong gusts, making conversation almost impossible without shouting. 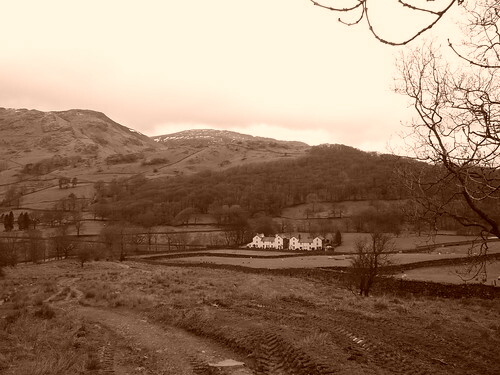 We continued up Thornythwaite fell, occasionally (and happily) stumbling upon more sheltered sections of path. With the wind so strong, and as a we weren’t familiar with the summit we decided not to try to reach the top and instead hoped to find the path down alongside Hind Gill. Now I have a confession to make; for the first time in a long time we sort of got lost, or at least we weren’t confident exactly where we were on the map. Looking back I think we’d probably reached the gap between Capell crag and Raven crag (maybe a little farther). As we did so the wind became so strong I could barely stand up… definitely time to turn around!! I never like having to retrace my steps, but on this occasion we had no choice, as we headed back we kept an eye out for any alternative paths, but none appeared. Obviously this wasn’t the most successful walk we’ve ever done, but we did get some good views and we did enjoy the part of the walk we managed, and we know Glaramara will be there for another time (and I’m sure we’ll try again on a less windy day). 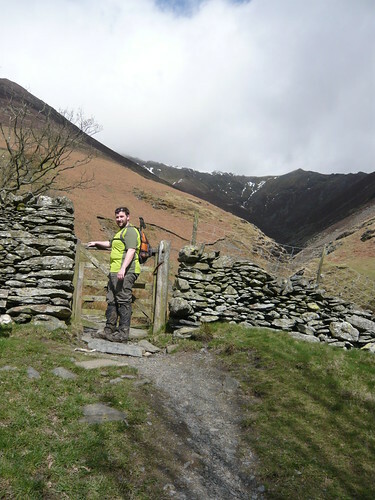 I guess I should rename this post “Ascent of Thornythwaite Fell”. 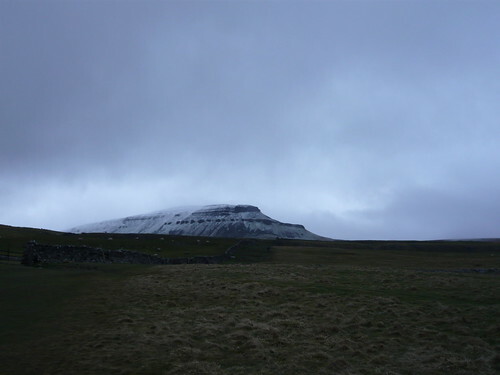 The Yorkshire 3 Peaks challenge is traditionally completed within 12hrs. It starts (and ends) in Horton in Ribblesdale in North Yorkshire. 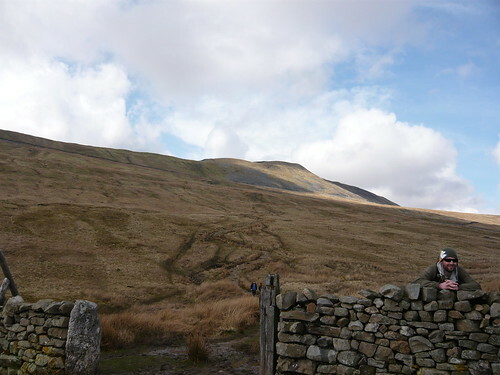 It involves climbing (and descending) 3 hills; Pen-y-ghent, Whernside and Ingleborough. We (7 enthusiastic walkers) did it on Easter Saturday 2010. We met in the dining room of The Crown for a DIY breakfast and to sort out food and drink for the walk. We set off at 7:20am, just 20 minutes after we’d intended, which wasn’t bad considering it was early and we hadn’t all walked together before. As we left the pub there was a light drizzle so we were glad we’d all put our waterproof gear on. As you’d expect there wasn’t much going on in Horton at that time in the morning, although we did see one or two other walkers. Shortly after passing the church we saw two little lambs that must have been born during the night, they still looked dirty and wobbly – bless! 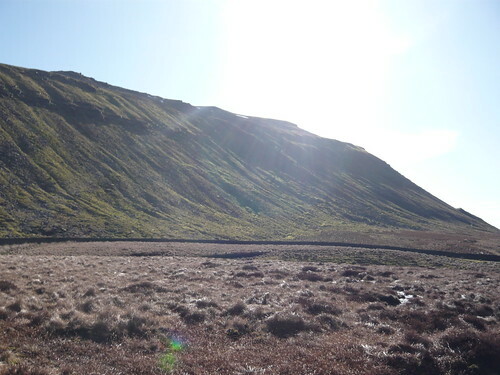 As we headed up to meet the Pennine way things didn’t start well for Chris G, less than 30 minutes after we’d set off one of his poles broke, cue lots of frustration as he kept trying to fix it and it kept falling apart as he was walking – poor Chris! We were passed by one speedy solitary walker early on, and another group soon caught us up. However as we began the ascent proper of Pen-y-ghent we soon began to catch everyone else up and felt comforted that our steady pace was the way to go. We made really good time to the summit, and everyone was still feeling really fresh and very happy to have conquered one summit before 9am – not your normal Saturday morning! Then came the bogs! 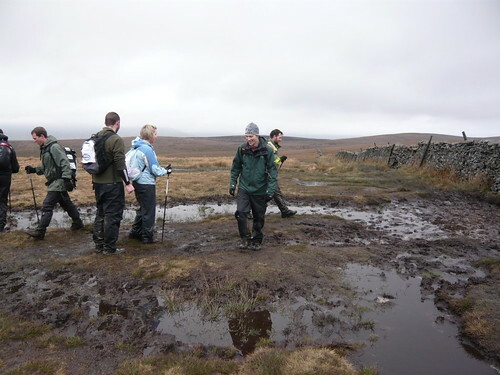 In the pub the night before, several walkers and locals had been full of stories of how awful the bogs were (apparently a 6′ 6” chap plunged into the bog up to his waist); some of us laughed it off, some looked concerned and some thought it would probably be bad, but manageable. At the time I was a little annoyed with these prophets of doom as I felt they could have put off a couple of walkers, but in retrospect they’d sort of prepared us for the worst-case-scenario which in the end turned out to not be far from the truth. The descent started well, a little icy but a good clear path; gradually things got wetter and wetter, until it was proper bog-hopping time! One by one our boots failed in their battle to keep the water out, until almost all of us had wet feet. We tried to not let the bogs hold us up too much, keeping on a direct track as much as possible, except where things got really deep or really mucky. I was amazed at how well everyone coped with his section of the walk, as not many of us had experience of these sorts of underfoot conditions. Spirits remained high throughout, even when both Chris’ fell in! Chris G managed a very stylish belly-flop type fall as he tried to jump a section of bog, and Chris R ended up submerged to the chest after trying to test how deep a boggy stream was (very deep it turned out). It was a long walk to Whernside down boggy paths, grassy paths, stony paths, tracks and road, but eventually we neared the Ribblehead viaduct. We stopped near the tea van for our lunch, tucking into our sandwiches in the rain, still in good spirits. Shortly after lunch the rain stopped, but more weather was not far away! The path towards Whernside was fairly busy with both casual walkers and 3-peakers, but it was a good path and we put down a good pace as we pressed on towards the summit. Hail!…it seemed we were destined to witness all weather today. 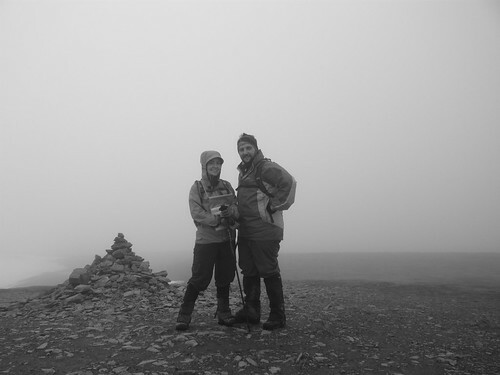 We continued on into the cloud, passing a poor woman who was very afraid of heights and not enjoying the walk at all. 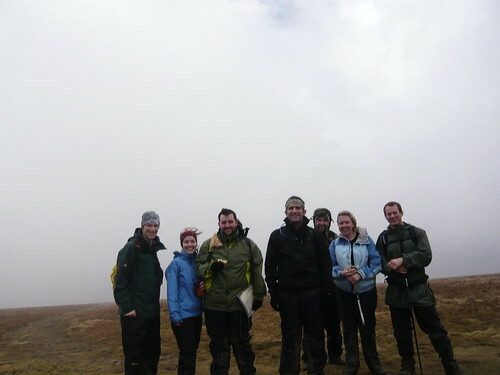 The summit was windy, cold and cloudy so it was whiskey and brownies all round. We met a chap and his dad training for the Caledonian challenge – sounded a bit much for me, but good luck to them. The descent from Whernside was a little difficult, no bogs or swamps, but it was fairly steep and we passed the scared-of-heights lady again, edging down on her bottom! As we headed for the third and final peak, we were all doing fairly well. A few aches and pains had arisen, and a few neurofen had been taken but considering how long we’d been walking, spirits were high. Next surprise…sunshine! (and sheep eating coconuts). It was a relatively short hop over to Ingleborough on good paths, passing some amazing limestone rock formations and a hole for wives (apparently). Soon we were on our final ascent; a steep zigzag up the side of Ingleborough. 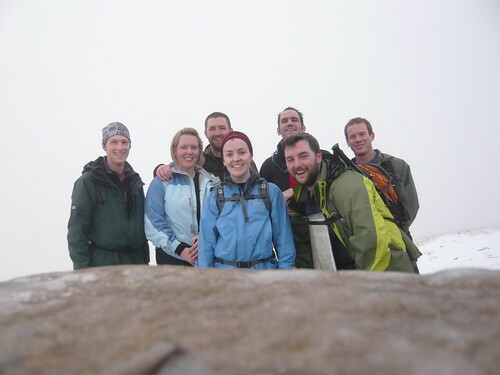 We gathered at the top of the steep section for a few jelly babies and to re-group for the final push to the summit. 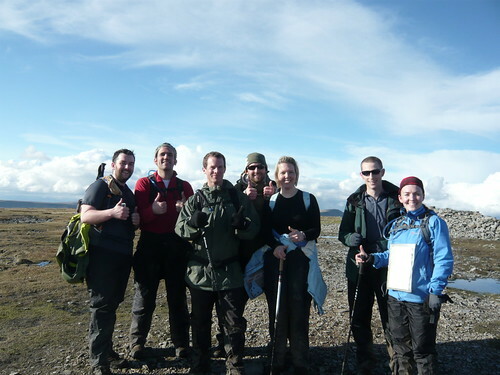 The plateau summit of Ingleborough was bathed in glorious sunshine, the sea shimmering in the distance, fabulous views all around and lots of smiling faces. Throughout the day we’d managed to stay slightly ahead of our estimated times but it was still going to need a good pace to make it back to Horton in time. The path back to Horton was clear and dry, so we pressed on with Chris G (aka “the machine”) setting a blistering pace in the front. Over the last few miles we spread out into 3 groups; the machines (Chris G and Dan), the steady eddies (Sid, me and Nathan) and the soggy one and his lady (Chris R and Em). It was going to be close, Nathan was sure we weren’t going to make it back in time, and it was indeed close… Chris and Dan made it back in 11hrs 45mins, Sid, Nathan and I in 11h 49, whilst Em and Chris R just missed 12 hours (by a mere 5 minutes)! These may not be record breaking times, but we also managed to have a good day in the process and remain friends! 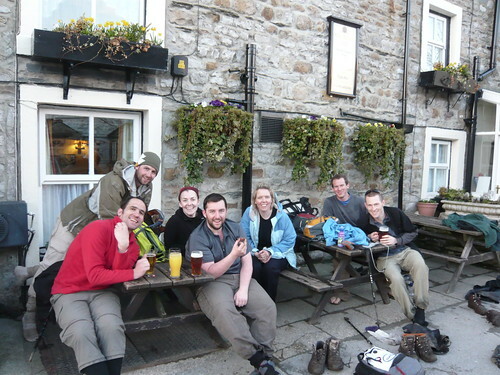 We gathered outside the pub, peeled off our soggy boots and socks, and celebrated with pints (soft and alcoholic) and creme eggs (thanks Chris). Then it was baths all round before a well-deserved dinner, birthday cake and a couple more drinks. All day we’d joked about having a big session to celebrate, but we were all far too tired for more than a couple and went to bed before 11pm! You can find more pictures here. Our Yorkshire 3 peaks was a fabulous day, due without doubt to the great people we walked with (and helped by a little sunshine). 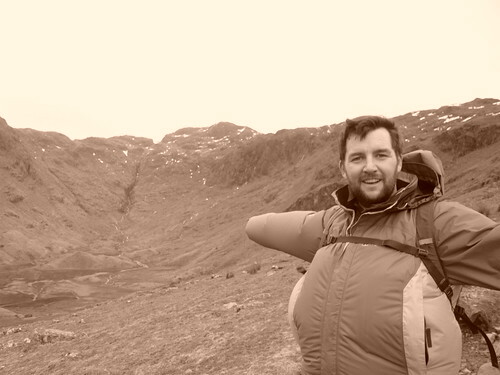 It’s a walk I would definitely do again and a challenge I would recommend to anyone who fancies a very long day of walking. Bonyag!!! We’ve just returned from a little holiday ooop north, which began with the Yorkshire 3 peaks last Saturday. I shall post lots more details and photos soon, but for now here’s a little montage Sid put together as a taster (I think it’s super). By the way the walk was FABULOUS!! Although the forecast was for heavy rain, I was determined to make it out for a walk this weekend. We met friends at Westerham, tucked into a delicious pub lunch, and fully fuelled headed out for a walk through the woods south of the town. It’s fair to say that perhaps we should have had a lighter lunch before the walk; the boys pies were massive and we were much slower than normal for the first hour or so. Happily the weather was much kinder than expected and there were only one or two little drops of rain, and most of the time we were just walking in t-shirts, which made a lovely change. We started by following the Greensand Way south into Squerryes Park, and on to Goodley Stock. We stayed on the Greensand Way all the way to French Street, where we picked up a track through Hosey Common to return to Westerham. Although not a very long walk, it was a very enjoyable one. We always like walking in woodland, and the woods around Westerham were lovely, and the land undulating enough to get our legs working a little. I’d love to return again in a few weeks as much of the woodland looked like it would be awash with bluebells. So that was our last walk before the Y3P (Yorkshire 3 peaks) and our holiday in the lakes. The weather doesn’t look good for the Easter weekend, but we’ll go fully prepared for wind, driving rain, bogs and maybe even snow, and perhaps we’ll be pleasantly surprised!